Compassionate Healthcare is dedicated to providing the best care for you and your loved ones. All of our employee’s first priority is your needs. As a private pay, non-medical provider, Compassionate Healthcare offers services not covered by Medicare or Hospice. We pride ourselves on keeping you safe, happy, healthy and at home – where you want to be. Compassionate Healthcare is dedicated to providing the best care for you and your loved ones. As a private pay, non-medical provider, Compassionate Healthcare offers services not covered by Medicare or Hospice. Compassionate Healthcare can help you get where you need to be, when you need to be there. We can drop you off and pick you up, or stay with you while you are there. Generally we provided transportation in addition to other services we provide. If you need to go to the grocery store, we can go with you, help you put your groceries away, and fix you a delicious warm meal. Need to run a few errands every week, like go to the post office, beauty shop, and visit a friend – we can get you there and back home. For the cost of using a taxi or non-medical transport company, we can provide an employee experienced in senior care that has been thoroughly screened, background checked, has proof of current Texas driver’s license and insurance. Compassionate Healthcare also carries non-hired auto insurance that covers our employees, your loved ones, and anyone that might be injured in an accident. The best part is that when we get home- we can help with any other needs you have. Once you sign up – you are in our system and we can help you anytime you need it. 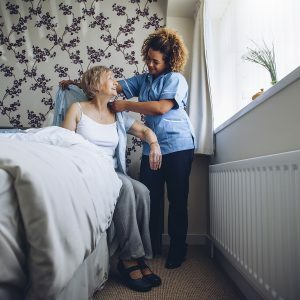 We have found that many seniors do a very good job of taking care of themselves, but just need a little help for certain activities that are not as easy as they used to be. Among older adults (those 65 or older), falls are the leading cause of injury or death. They are also the most common cause of nonfatal injuries and hospital admissions for trauma. We know that taking a bath or shower is tough sometimes. It can be slippery, hard to get in and out of, and you just can’t reach all the places you need to. We can have an experienced senior care provider come by your home and help. They can standby in-case you need them or they can use their professional experience to help. We offer programs for one, two, or three shower/bath visits per week or can cater a plan to meet your needs. If you need them to help with something else while they are there, just let us know and we can make sure it happens. Compassionate Healthcare can call you each day to see how you are and just check in with you. We love to tell our clients Good Morning! There is nothing better than hearing a familiar voice on a continual basis. It starts the day off right and puts a smile on both our faces. We can also alert the correct people in case anything is wrong. We will be happy to customize any service plan that will best fit you or your loved ones needs. If you do not see what you need listed, just give us a call at 817.570.9901. We would be happy to set up a service exactly the way you want it! Services can range from 3 hours to 24 hours a day and be a one-time visit or long term. You are in complete control of the times, amount of hours, days and length of your service. Our dedicated team of caregivers can provide you or your loved one piece of mind and all the help they need. We help ensure safety in the home, while making sure bathing, eating, and all other personal care is achieved. We will go with or for you to run your errands like grocery shopping, pharmacy visits, senior centers, or just to visit friends and family. We will also make sure to get you to your appointments with the doctor, rehab, or other needed occasions. We can cater service to your individual needs.